The Continental Ultra Gatorskin is a tyre which tries to strike that most difficult balance – tough enough puncture protection to satisfy the everyday rider, while catering for the demands of enthusiasts who insist on a brisk and low rolling-resistance tyre. Available in a range of widths and with budget wire construction as well as folding kevlar beads, the Gatorskin is a strong contender as a relatively rapid commuting or training tyre. I personally like my tyres to be either very fast or very tough; after a few years using the Gatorskin I now tend towards either a ‘pure’ racing tyre like the GP4000s or something really tough, like a Marathon Racer. 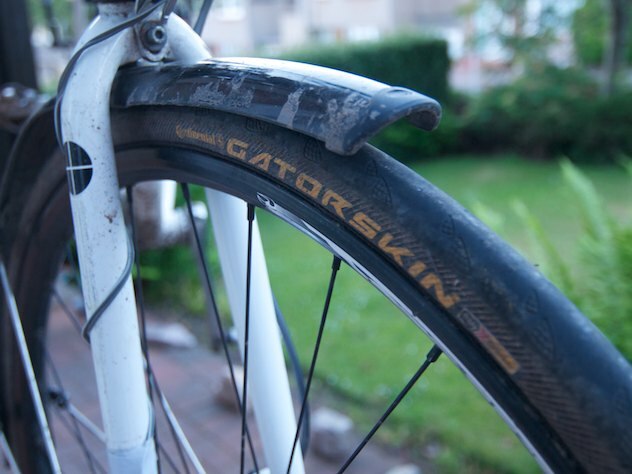 However, I just retired a pair of Gatorskins from my wife’s commuter after three years’ use in central Edinburgh… and just one flat! If you have one bike to do it all, they’re certainly worth a look. (At the time of writing, Wiggle have a 25% discount while Chain Reaction are doing 30% off). The Ultra Gatorskin is pretty competitive in weight terms – a 23mm wire bead version comes in at 280g, whereas the Specialised Armadillo varies (400g for the All Condition, 260g for the Elite in the same width). It’s not actually all that much heavier than the full race construction GP4000s, at 205g (23mm) – although the tyre construction makes them significantly slower. The 25mm size would be expected to gain around 5% over the 23mm for this reason. 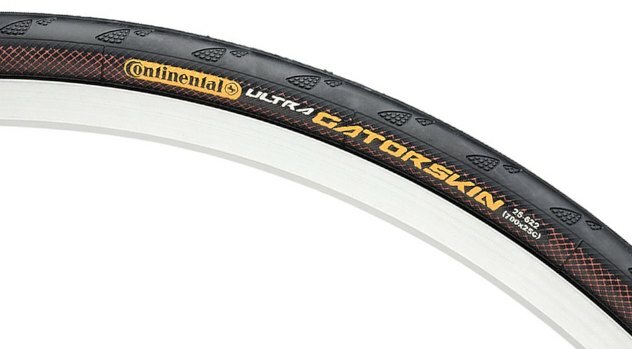 The Continental Ultra Gatorskin doesn’t quite have the buttery feel of a top race tyre, but it’s not too bad: only if you concentrate does the deadening effect of the extra protection become obvious while riding. Compared with a wider tyre such as the Marathon Racer, the Ultra Gatorskin definitely retains the feel of a narrow road bike tyre. So, again it comes down to the compromise. How much of the feeling of a true road tyre are you willing to give up, and for how much puncture protection in exchange? To state the obvious, road tyres like this are not designed to emphasise comfort. If anything, the Ultra Gatorskin works out a bit less comfortable even than a pure road tyre, because adding armour to a tyre makes it less supple. However, fitting these tyres in a wider size will go a long way towards providing a respectable mix of comfort and performance. The Ultra Gatorskin doesn’t benefit from Continental’s tacky Black Chilli rubber or from fancy dual-compound construction; it sticks to the basics with a slick natural rubber tread. Reviews of the grip of the Gatorskins are mixed. I’ve always found performance to be good, except when a road is really greasy (at which point all cheap or durable tyres will start to struggle). In exchange the rubber tread lasts a lot longer. Take your pick! It’s important not to underestimate the advantage of a tougher (or wider) tyre when considering grip, simply because it puts you in a position of needing absolute grip less often – you don’t need to swerve for broken glass quite as much with a puncture-resistant tyre, and you don’t need to dodge potholes as much with a wide one. The Poly X Breaker provides flat protection in the central part of the tread, while DuraSkin weave provides cut resistance for the whole carcass. 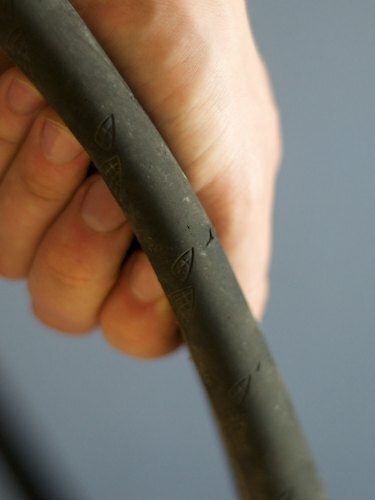 I’ve personally always been pleased with the performance of the Ultra Gatorskin in terms of flat prevention – often just one or two flats through the life of the tyre before a sudden rash of them indicates it’s reached end of useful life. The pair pictured on this page have just finished a three year shift of daily commuting in central Edinburgh. Loads of cuts but just one flat at the end which prompted me to inspect the carcass (and decide some of the slashes in the tread were just a little big for comfort). There’s more depth to the slick tread of the Ultra Gatorskin than is found on many road tyres, and as a consequence you can expect to enjoy higher mileages – mine have always lasted for a surprisingly long time before cumulative cut damage makes me too nervous to continue, or I get a spate of flats as a few pieces of glass penetrate all around the same time. While I’ve never had any trouble myself, there are plenty of reports (as always) on the internet in which people recount fitting this tyre and almost immediately writing it off on a pile of glass. All I can say is, first, there’s a hefty element of luck involved; second, don’t assume that just because your tyre has a puncture belt that you can ride it over glass with impunity. It will eventually get through almost anything! Neither of the cuts above or below, which are typical of the damage covering this tyre after three years’ use, got through to the tube. Good work Continental! With respectable speed, respectable puncture resistance, respectable weight and a respectable price, the Gatorskin is an all-round balanced compromise and you can see why Continental are able to claim it’s the best selling 700x23c tyre in the UK. If you want to ride fast on a supple race tyre, consider the GP4000s. If you want to have ultimate puncture protection, you need something like the Marathon Plus. If you want a really cheap tyre, just buy whatever’s on the best offer today. If, like many, you want a balance of all of the above, you should definitely be taking an interest in the Continental Ultra Gatorskin. At the time of writing, Wiggle have a 25% discount while Chain Reaction are doing 30% off. 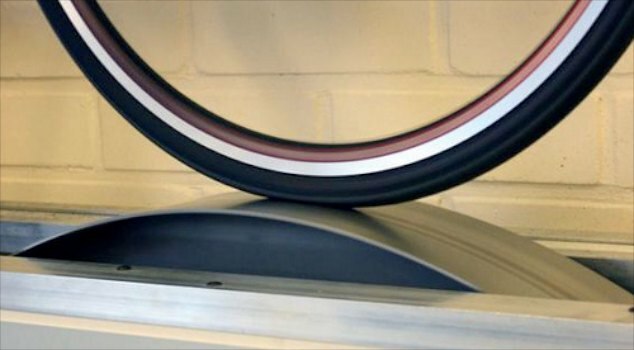 It’s possible to measure rolling resistance with a power meter. The measurement will depend on the surface you use to test but if you compare several tires on the same surface the relative ranking is pretty robust even on a different surface. Well, you can certainly do it on the road but, you’re right, sheltered is better (as with all field tests). An alternative is to use rollers, if you have them, and then do the conversion from roller to flat surface. A trainer isn’t quite as good because it’s hard to know the exact load on the roller — with rollers you can get the load by seeing how much weight is on the drive wheel but on a typical trainer you clamp the drive wheel into the fixture and adjust the tire-to-roller pressure with a screw or lever (though there are some trainers that do use the rider’s weight to set the contact pressure). Anyway, in this case, it’s sort of handy that the relative ranking between surfaces is pretty robust — the exact measurement of Crr will vary between the roller and real roads but the relative ranking will almost always stay the same. I’m impressed with my Durano pluses 25c. Not difficult to get on. Roll well on my winter bike rigida china rims. Thanks for excellent review of GSs. I put 27 x 1 1/4 GS on 1980s beater a couple of years ago and really enjoy them. Do you think the 32s would be a good replacement for the standard 700x35c Bontrager tyres on my Trek 7.1 hybrid? Bontrager tyres are puncture prone but comfy ride. How much less comfort 32 GS compared to BR 35c? Would they fit the hybrid’s Bontrager wheels? Finally, what is the difference (pros/cons) between wired and folding? There’s roughly a 15% difference in air volume between 35mm and 32mm. You will definitely notice the difference, but I think you should still find them quite comfortable- you can always run them a little softer to make up for it. There’s no functional difference between wired and folding, the folding ones are just lighter (and of course they take up less room before you put them on your bike). It’s quite a significant weight, usually – the only real reason to go wired is to save money.